The grid frequency is always moving around its nominal value of 50 Hz by the control. However, times and strengths of over-frequency and under-frequency are not always balanced. In the long-term this summs to a average deviation from the nominal value of 50,000 Hz. For historical reasons, the compliance of the nominal value is also long sought, so that eg. watches can use the the mains frequency as a reliable timebase. The network time corresponds to the time, which results when after 50 oscillations of voltage, a second is incremented. If the mains frequency is over the 50 Hz, then the network time precedes to real time. At lower frequency, the time is slower counted. Through the long-term controls the watches wich are based on the frequency have short-term deviations, but in the long term they differ only little from the time. Quartz watches tend to show an opposite behavior, they are very accurate in the short term, but the small differences add up to continuously, so that the difference to normal time is increasing. If the deviation of grid time to the Coordinated Universal Time (UTC) is above +20 seconds, then the nominal value of the mains frequency is reduced by -10 mHz to 49.990 Hz. If the deviation to UTC Falls is underneath -20 seconds, then the nominal value of the mains frequency is increased by +10 mHz to 50.010 Hz. The current grid time is 6,58 seconds, the set-value of the mains frequency is 50 Hz. 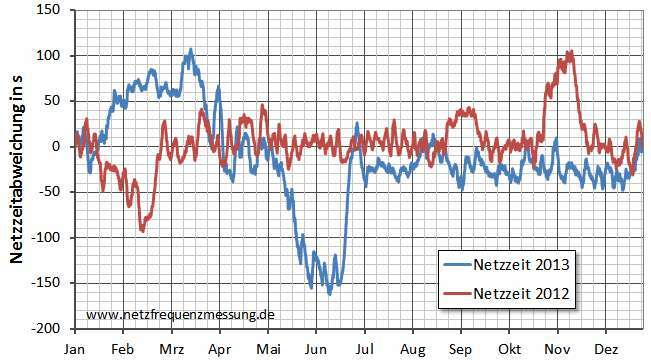 The following figure shows the network time deviations for the years 2012 and 2013. Clearly visible is the commuting by 0 seconds grid time. 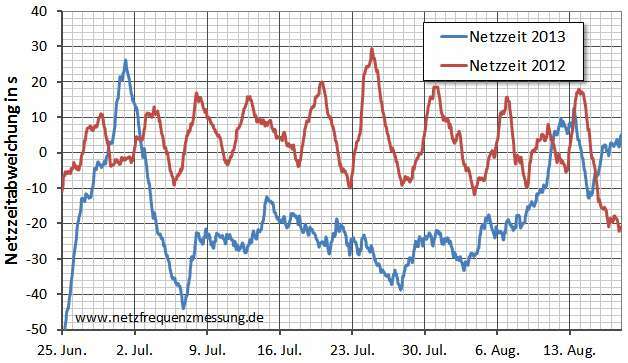 Despite deviations up to -160 s in June 2013, the network time comes in two years at the end back to an error of 0 seconds. Looking at individual months, then it turns out that the correction of network time deviation occurs at intervals of days or weeks. More information can be found at Synchronous Time correction from swissgrid).